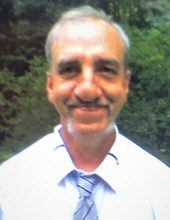 Kelly Ray Hurley, 48 years of age of Hurley, VA, passed away Thursday, March 7, 2019. Born April 22, 1970 in Stopover, KY, he was the son of Bertha Hamilton Spencer of Hurley, VA and the late Mozee Hurley. Kelly enjoyed fishing, riding motorcycles, spending time with his family and was of the Church Of Christ faith. A loving son, father, grandfather, and brother. In addition to his father, he was preceded in death by his brother Tony Hurley. Survivors in addition to his mother Bertha Hamilton Spencer of Hurley, VA, include his daughter Ashley Brooke Hurley of Grundy, VA; sons Johnathan Andrew Devan Hurley and wife Jessica of Stopover, KY, Bradley Keith Hurley of Grundy, VA; sister Ernestine Justice and husband Robert of Big Rock, VA; brother Junior Lee Hurley and wife Charlene of Hurley, VA; half-brother Clifford Allen Spencer and wife Judy of Hurley, VA. He is also survived by several nieces and nephews and his grandson Riley Andrew Hurley. Funeral service for Kelly Ray Hurley will be held at the Shortridge-Ramey Funeral Home Chapel of Grundy, VA, Monday, March 11, 2019 at 12:00 noon with Pastor Otis Blankenship officiating. Burial will follow in the Barker Cemetery on Hurricane Creek in Stopover, KY. The family will receive friends at the Shortridge-Ramey Funeral Home Chapel, Sunday, March 10, 2019 after 6:00 p.m. with evening service to be held at 7:00 p.m. The family of Kelly Ray Hurley have entrusted the care of their loved one to Shortridge-Ramey Funeral Home of Grundy, VA.
"Email Address" would like to share the life celebration of Kelly Ray Hurley. Click on the "link" to go to share a favorite memory or leave a condolence message for the family.